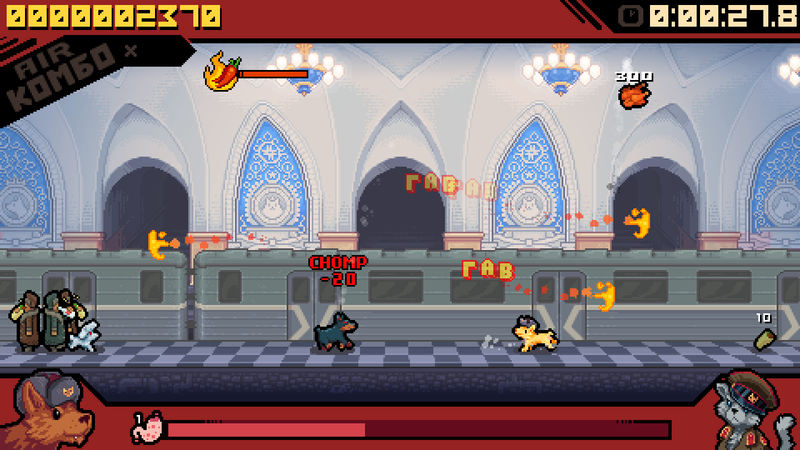 Game Review: ‘Russian Subway Dogs’ Out Today on Steam! That’s right, you read correctly. 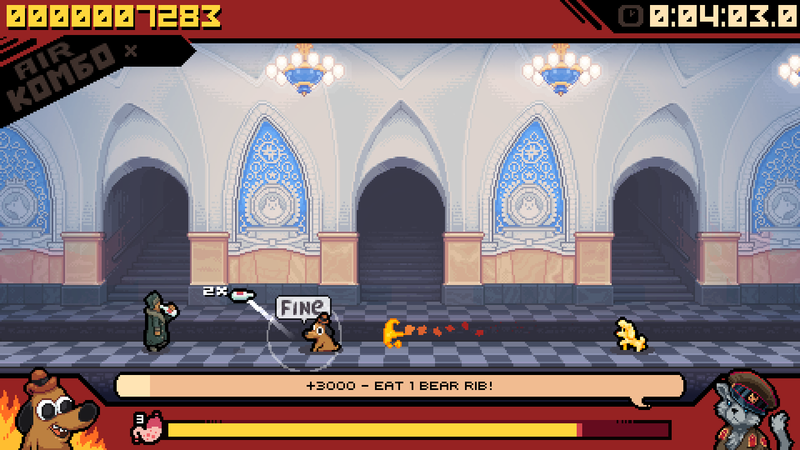 The latest game from Spooky Squid (They Bleed Pixels) about burrito stealing, molotov cocktail juggling canines of the largest country in the world is out today! 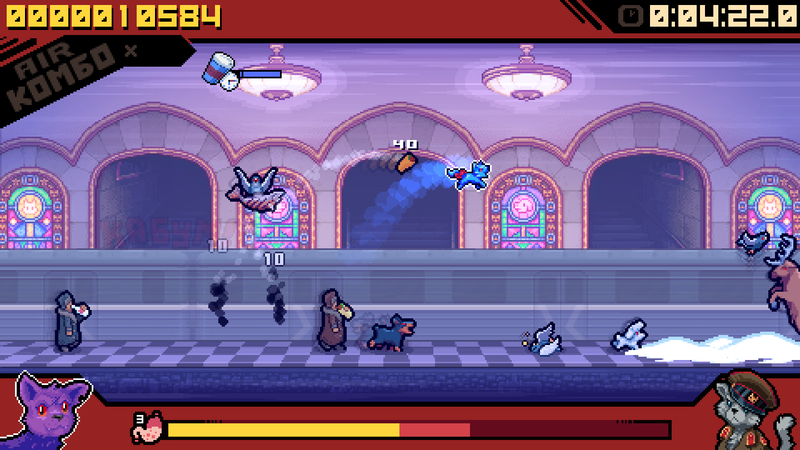 The concept is simple: you are a (somehow incredibly cute, pixelated) dog roaming the subways of – you guessed it – Russia. As passengers exit the cars, some are eating burritos and some are drinking vodka. It is your job to scare the burritos out of their hands, catch them in the air, and rack up points. Meanwhile, you must scare the vodka bottles out of their hands in order to make your meal extra crispy and delicious – and therefore worth more points. The more you juggle the bottle, the higher the multiplier. But watch out! There are other, mean, not-so-cute dogs roaming the subway, trying to steal your burritos! You must use the molotov cocktails to eliminate them, and rule the subways! Each level has challenges (like how many burritos you can catch mid-air, and how many times can you juggle a vodka bottle before it drops). Completing challenges earns you a bone, and those bones allow you to unlock things like new characters. Although it seems unlikely, maybe you aren’t a dog fan. Have no fear! You can unlock Proletaricat after the first level! The concept is simple, yet incredibly addicting – like the most addictive games out there. I found myself playing the first level for nearly an hour, just trying to unlock an A ranking. Meanwhile, I was trying to see how many times I could juggle the vodka bottles. Trying to beat your own score makes for endless fun! As you progress, you enter new subways with new challenges. The characters change – like the people carrying grocery bags with both food AND vodka! Set them on fire, and all of their purchases leave the bag while aflame – meanwhile they start picking up the pace. It’s these small differences from level to level that keep things interesting, while sticking to the simplistic yet incredibly fun concept. Now it’s time for me to go, so I can try to unlock Question Hound from KC Green’s Gunshow – and see just how many vodka bottles he can juggle at once. Russian Subway Dogs gets an A. Purchase today on Steam. Coming soon to Xbox One, PS4 & Vita.